DANBURY — Shares of FuelCell Energy rose 16 percent Friday after state officials approved the Beacon Falls Energy Park. The park, once constructed, will be the largest of its kind in the world, producing more than 63 megawatts of electricity. Under the plan approved unanimously by the Connecticut Siting Council, CT Energy & Technology will develop the project on eight acres owned by O&G in Beacon Falls. FuelCell Energy (Nasdaq: FCEL) will supply and maintain the fuel cells at the park as part of a long-term service agreement. Executives with Danbury-based FuelCell Energy have said they expect to receive significant revenue from the project but have declined to offer specific estimates for the work. A similar, but much smaller, project in Bridgeport that supplies about 15 megawatts has produced more than $125 million in revenue for the company from sales and service agreements. The project will also help ensure job growth, executives have said, as FuelCell moves forward with a phased expansion plan that would double its production capacity to about 200 megawatts annually. State officials have offered the company a $10 million loan to help with the $65 million expansion. Up to half of the loan is forgivable if FuelCell hires an additional 325 workers as part of the expansion. The company already has about 500 employees in the region. FuelCell Energy’s stock surged more than 20 percent during early trading Friday, before closing at around $6.16 per share. The stock also rallied earlier this week by more than 10 percent after the company announced a deal to supply Pfizer with a 5.6 megawatt power plant that will provide both heat and electricity to the company’s 160-acre campus in Groton. Pfizer will purchase the power and steam under a 20-year agreement. “This power-purchase model delivers immediate value while increasing electrical reliability by providing the security of on-site power with a financial structure that avoids an investment in power generation assets; and FuelCell Energy installs, operates and maintains the fuel cell power plants,” Chip Bottone, the president and CEO of FuelCell Energy, said in a statement released earlier this week. The positive news comes on the heels of the company falling short of expectations last month with its reported fourth-quarter loss of 38 cents per share. Most analysts had expected a loss of around 27 cents per share. The company’s revenues for the quarter, however, were mostly in line with expectations, with about $51.5 million reported for the quarter as compared to $47 million for the same period the previous year. 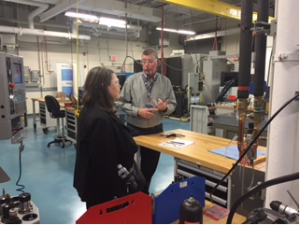 Nancy Garland, the Lead for the Manufacturing R&D Program at the Department of Energy’s (DOE) Fuel Cell Technologies Office, recently visited the Connecticut Center for Advanced Technology’s Advanced Manufacturing Center. Dr. Garland was interested in CCAT’s capabilities for manufacturing, including prototype fabrication, multi-material 3D plastic printing, 5-axis precision machining (for parts up to 20 inches), powdered metal additive manufacturing, non-contact inspection, reverse engineering, and wire electrical discharge machining (EDM). CCAT’s manufacturing and process solutions help companies to run better, faster and cheaper by deploying technologies that will increase productivity without interfering with your current production environment. DOE has expressed interest in transitioning the research and development for the emerging hydrogen fuel cell industry to advance manufacturing to increase production, drive down costs, and increase durability. CCAT will be managing the DOE Northeast Technical Exchange Center, which will be part of national effort to facilitate the development and expansion of the domestic supply chain necessary for the manufacture and scale up of hydrogen and fuel cell systems in the United States. 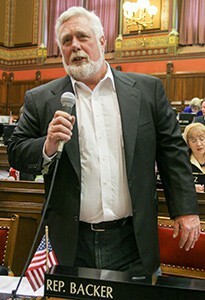 State Representative Terry Backer was elected to the Connecticut House of Representatives in 1993 from the 121st Assembly District in Stratford. Rep. Backer, also known as the Long Island “Soundkeeper”, served in numerous positions in the legislature, including Vice Chairman of the Appropriations Committee, Chairman of the Energy and Technology Committee, Assistant Majority Leader and Assistant Majority Whip. During his tenure as Chairman of the Energy and Technology Committee (2002-2003), Backer authored legislation that refined Connecticut’s 1998 Electric Deregulation and Restructuring law and improved the components about environmental and renewable energy. Rep. Backer focused on renewable energy and energy security. Rep. Backer had a vision for Connecticut’s clean energy future that included fuel cell technology manufactured here in Connecticut. He supported numerous policies to encourage the development, manufacture, and use of hydrogen and fuel cell technologies. As a member of the Environment Committee, Rep. Backer focused his activities on water quality improvements, reduction of pollution from storm water runoff, and protection of Long Island Sound. The Energy Department today announced up to $35 million in available funding to advance hydrogen and fuel cell technologies that will reduce our nation’s dependence on foreign oil and cut harmful carbon emissions. As part of the Administration’s all-of-the-above energy strategy, this funding will accelerate American innovation in hydrogen and fuel cell technologies by supporting research and development, early market deployments, and domestic manufacturing. The Department also aims to develop collaborative consortia for fuel cell performance and durability and advanced hydrogen storage materials research to leverage the capabilities of national lab core teams. As FCEVs become increasingly commercially available, the Energy Department is focused on advancements to enable hydrogen infrastructure including production, delivery, storage, and manufacturing, as well as continuing to reduce fuel cell cost and improve durability. This FOA includes highly targeted and collaborative lab-led consortium projects in both fuel cells and hydrogen storage technologies.